Many people associate the saxophone with jazz or rock music, and with some of the legendary saxophone players, such as John Coltrane, Charlie Parker, and Clarence Clemons. But what the vast majority of the public doesn’t know is that there are several types of saxophones available to musicians, and that the instrument has a wider range and flexibility than most people think. The saxophone is a member of the woodwind family, and is usually made of brass. The instrument is very popular in military band music, jazz and rock. The saxophone uses a single-reed mouthpiece. Musicians (called saxophonists) can choose to play any number of saxophones, based on the type of music they wish to play, their experience with the saxophone and the range or the key of the particular instrument. The four most common are the baritone saxophone, alto saxophone, tenor saxophone and the soprano saxophone. 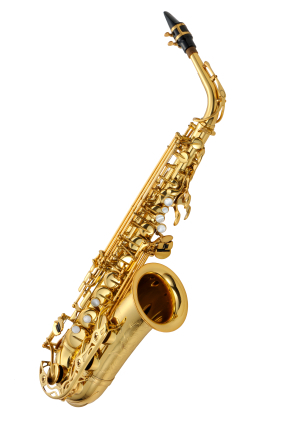 Other types of saxophones that one might encounter include the C-melody saxophone, the bass saxophone, the C soprano, the F baritone, and the F mezzo soprano. When most people think of the saxophone, they’re probably thinking of the tenor saxophone, which is widely played in rock and jazz music. The tenor saxophone is a relatively large instrument, with a large mouthpiece, and long rods and tone holes. This instrument is used for modern day jazz and rock because it plays in the key of B flat. The alto saxophone is generally regarded as the saxophone for beginning students. The alto saxophone is medium in size, which makes it easy to hold, especially for younger students. The smaller mouthpiece also helps the beginning student master the instrument. The alto saxophone is curved in shape, almost like a “J’ and it plays in the key of E flat. This is the instrument you’ll find students learning for the school band. Another type of saxophone is the soprano saxophone. This soprano saxophone may be curved or straight in shape, but is regarded as an instrument for experienced musicians, and not for beginner students. Like the tenor saxophone, this instrument plays in the key of B flat, and is therefor the highest pitched of the saxophone instruments. The soprano saxophone can give off a variety of tones, depending on its shape and how it’s played. This instrument requires quite a bit of practice to master, and is often used in jazz. The baritone saxophone plays in the key of E flat, and this is the largest of the saxophone instruments. The very deep bass sound of the instrument is why it’s used often in jazz solos. The baritone saxophone, because of its size, requires that the musician wear a harness to help support the weight of the instrument. An extension allows the saxophonist to play the baritone saxophone in a low A, thus increasing its range.